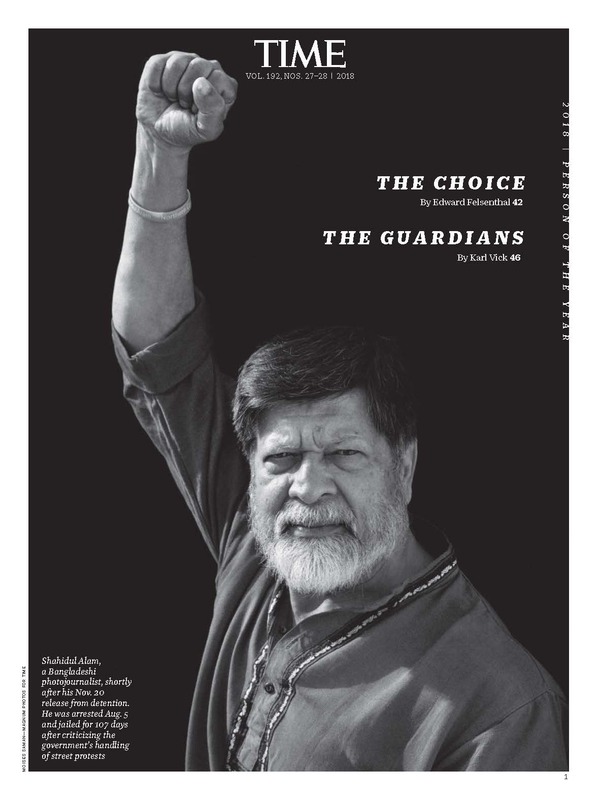 Tribute video for 2018 Lucie Awards Honoree Shahidul Alam for the Humanitarian Award. Presented at Zankel Hall at Carnegie Hall in New York City, Sunday October 28th 2018. Presented and Received by Gayatri Spivak. 2018 Lucie Awards Honoree: Shahidul Alam, Humanitarian Award from Lucie Foundation on Vimeo. ‘The ambulance is more Muslim than you’. ?That was the answer Abdul Sattar Edhi gave to a question when once asked ‘why must you pick up Christians and Hindus in your ambulance?’ By any stretch of imagination, Abdul Sattar Edhi is an enigma to most people. None of us truly understand him. I often think that Edhi walks a fine line between passion and lunacy. I am not able to comprehend why this man insists on doing what he does, in the capacity that he does it, for as long as he has done it for. The heart wants to register it, but the mind questions the motive. Motive. What the hell is his motive? Please, someone tell me what this man?s motive is. Through no easy deduction, I submit that I have discovered the answer to my question. It has taken every critical bone in my body to genuinely understand the answer, but folks, I can safely say that I have finally reached a verdict: there is no motive. There is. No. Motive. Edhi has destroyed my carefully built assessment of Man over the years. He has ruined my calculated analysis of the weaknesses of people. That he has negated all my years of hard earned views on Man single handedly almost leaves me infuriated with him. He has forced me to start over from scratch. For that, I cannot forgive him. 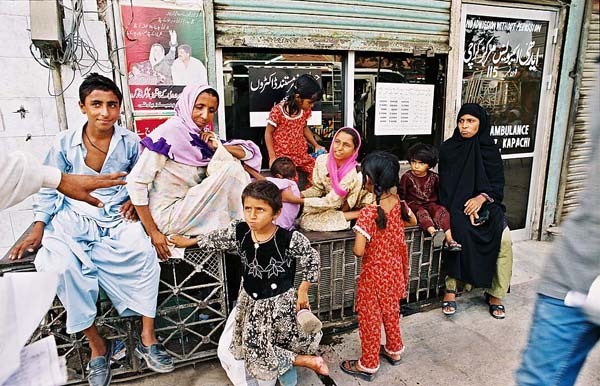 Abandoned family outside Edhi Tower in Karachi. This is a man that I cannot imagine my own life without. Mind you, I have never met him. I don’t want to. There isn’t a single day in my life that has collectively added up in honor to justify me being able to sit opposite Edhi. I have at best, been able to find the courage to go and drop off some extremely basic things at one of his many, many, charity centers the world over. While there, I stay for just long enough to try to fathom what all this man has done for my country. Being an impossible task, I soon give up trying to reach to the bottom of that barrel and leave very quietly. I imagine it is pretty much what anyone what do. For those unaware of who this man is, let me put it in a very simple way: Hollywood has Batman, Superman, The Hulk, and Spiderman. Pakistan has Edhi. 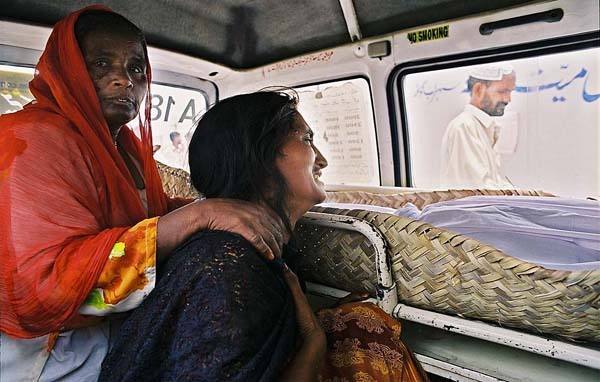 A mother grieves for her son in an Edhi ambulance. What has inspired me to write about Edhi? He certainly doesn’t need any more press validating his incredible efforts or work done. He already has, safely locked away, the hearts of some 170 million people. But yesterday, I was brought to my knees by an action I witnessed that for lack of any other descriptive word, I can only describe as ‘Edhi’. In about a week, InshAllah, I will be traveling to Pakistan. My ticket is booked; visa arrived this morning; shalwar kameezes are at the dry cleaners. It?s not the ideal time to be going to Pakistan. A recent report by the Atlantic Council said Pakistan ?is on a rapid trajectory toward becoming a failing or failed state.? A New York Times editorial last week put it this way: ?Almost no one wants to say it out loud. But between the threats from extremists, an unraveling economy, battling civilian leaders and tensions with its nuclear rival India, Pakistan is edging ever closer to the abyss.? The abyss grew depressingly deeper this week, when the Sri Lankan cricket team was attacked in a commando-style ambush, leaving eight people dead and several players wounded. Twelve gunmen ? carrying sacks of ammunition ? attacked the team?s bus in broad daylight ? in the heart of Lahore ? and then escaped in motorized rickshaws. What?? The terrorists knew what they were doing: attack the nation?s most cherished pastime ? 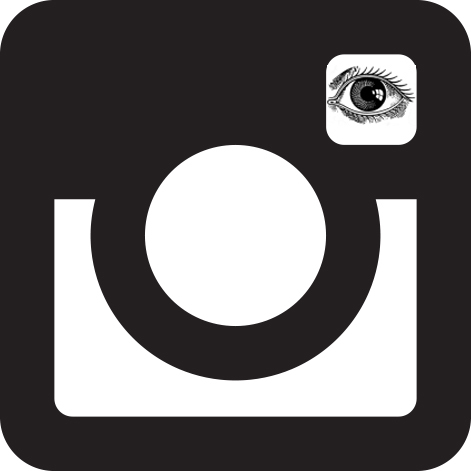 it?s symbol of camaraderie and goodwill ? and you attack the heart and soul of the country and instill maximum fear. So, why exactly am I going to Pakistan when relatives there and here are counseling not to, and those who can are leaving? It?s to witness the work of two men ? one a Pakistani, the other an American ? who are tirelessly, quietly, and with humility working to improve the lives of Pakistanis so the desperation and hopelessness at the root of the current chaos, one day, diminishes. An AP photograph in the NYT shows those who died in the Lahore massacre lying on stretchers covered with blood-stained white sheets with four letters printed on them: EDHI. Edhi is hardly known in the United States, but to Pakistanis around the world he is a true hero. In the past 60 years, he?s created one of the largest and most successful health and welfare networks in Asia. He started off begging for donations. Today, he runs a nationwide organization of ambulances, clinics, orphanages, homes for the physically handicapped, blood banks, mortuaries, and much more. 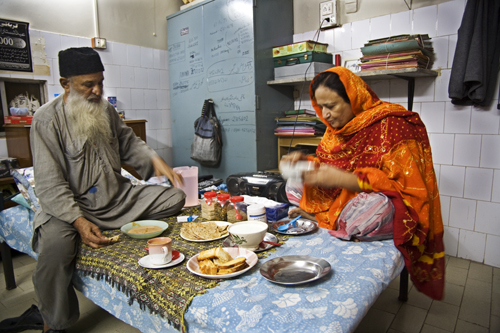 Edhi, and his wife of nearly 45 years Bilquis, live in a small two bedroom apartment next to his office in one of the clinics. He accepts no salary. He?s on call 24 hours a day. Their wedding night is indicative of how they spend their days: Edhi and Bilquis rushed a 12-year old girl with major head injuries to the hospital and supervised blood transfusions throughout the night. His vision of charity is at the heart of Islam. Why don?t we hear about it? Many know of Greg Mortenson?s inspiring story through his best-selling book ?Three Cups of Tea?. He is receiving the Sitara-e-Pakistan, Pakistan?s highest civilian award, in Islamabad on March 23rd. No doubt, he will receive the award accompanied by his indomitable Pakistani staff, including Suleman Minhas, with whom I?ve been communicating. After two brief phone conversations, and not even a shared cup of tea, I already feel like family.. I call him ?bhai? (brother); he writes to me as ?respected Salma?. Most of our conversations have focused on his assuring me not to worry; that the minute I land in Islamabad, I will be his most revered guest. No wonder Mortenson was blown away by Pakistanis? generosity and warmth. Maybe Mortenson will bring some of the girls from his schools, because as he always says, they are the true heroes. Perhaps Shakeela, who started by writing with sticks in the sand, and is now in her third year of medical school in Lahore. She will be the first locally educated woman to become a physician. Or maybe Ghosia Mughal, one of the first students to return to school in her village after the devastating 2005 earthquake in Azad Kashmir, that killed her mother, several of her siblings and left her father paralyzed. ?Watching that first brave girl enter a school, is like watching man taking his first step on the moon,? says Mortenson. ?It?s one giant leap for mankind.? Mortenson is keenly aware that behind one girl comes dozens more, eventually hundreds and thousands. No doubt there are tragic forces at play in the country trying to undermine the fabric of its politics, culture, society, and soul. Sometimes seemingly overwhelming forces. But there are also kernels of hope that remind us that all will not be lost to violence and a distorted mindset. There are people like Edhi and thousands more working each day to feed, nurse, console, support and shelter. There are people like Suleman and hundreds of others fiercely loyal to Mortenson?s commitment ? and the commitment of so many NGOs around the country ? to educate Pakistan?s children. There are young women like Shakeela, smart, capable, determined, and feisty, who will ultimately change the country, if given the chance. This is the Pakistan I?m going to see. And when I get back, these are the stories I?m going to share, with anyone willing to listen.